As I was preparing to lead a school group in Marsa Abu Dabbab, a shallow bay renowned for its green turtles and the occasional dugong, I could not believe my ears when I heard someone shout “swordfish”. 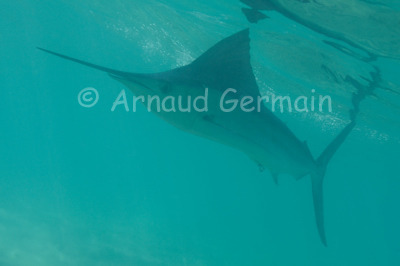 I grabbed my camera, my fins and went into waist deep water. I spent 5 minutes with the sailfish which appeared disorientated. It came several times quite close. I took about 50 shots in the 5 minutes we spent together. Nikon D700, Nikon 28-105 mm macro at 70mm, F9, 1/400th, ISO 400, Ikelite Housing. No strobe. Marsa Abu Dabbab, about 1 metre down, snorkelling, Marsa Alam, Egypt.